Eating healthy is hard no matter who you are. But eating healthy when you’re on a tight budget can feel damn near impossible. During my broke patches, I found myself eating a lot of $5 subs and pizzas — and on my darkest days, cans of Beefaroni. I didn’t feel good, but I didn’t have the money, time or knowledge to cook — or at least that’s what I thought. But, here’s the thing: My budget was higher than 45 million Americans who receive food stamps. And I only work 40 hours a week and don’t have kids to support. If I could barely figure out how to eat healthy with my budget and time constraints, I can’t imagine how much harder it must be for other people. So I was excited to learn about Leanne Brown, a crusader for home cooking and healthy eating — all on a food stamp budget. Her cookbook, “Good and Cheap: Eating on $4/Day,” is available as a FREE download on her website, and is jam-packed with smart tips and accessible recipes. I chatted with Brown — who’s definitely my new food crush — to discover her best tips for eating healthy on a budget. And, many of these people turn to processed foods or eating out — they believe cooking is too time-consuming or expensive. But Brown knew the opposite was true. “Cooking can make everything so much cheaper,” she says — and of course, healthier. So, for her thesis project, she created a cookbook “generally aimed at people who are living on food stamps,” and ended up with the tagline “Eat well on $4 a day” — the average amount people have to work with for food. 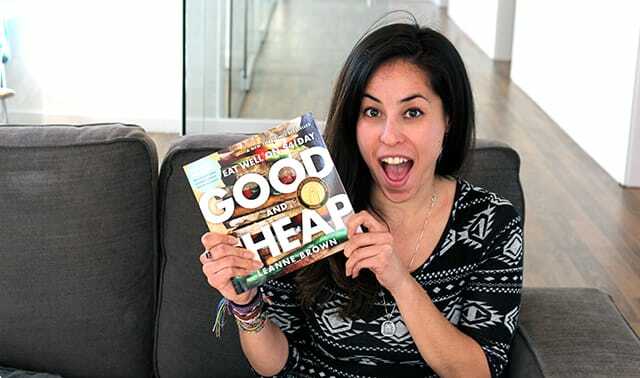 After “Good and Cheap” went viral on Reddit, she ran a Kickstarter campaign to fund a print version of the book. Her goal was $10,000 — but she ended up raising over $144,000. “It was a totally life changing, insane experience,” she says. Now the book is available nationwide. For every copy sold, Brown gives one away to nonprofits across the country, which then give those books to people in need, or include them as part of broader public health programs. Though Brown’s story is inspiring, you’re probably here for her tips. Learning healthy eating habits is a marathon, not a sprint. If you push yourself too hard in the beginning, you’re more likely to give up. “Don’t expect to go from very rarely cooking, to cooking three meals a day, every single day,” says Brown. The same goes for kitchen-related purchases. “If you think, ‘I can’t start cooking until I have everything I could possibly need, and a really, really well-stocked pantry,’ then you’re probably never going to do it,” says Brown. Prioritize your purchases based on needs, and add items one-by-one to stay on budget. The “start slowly” rule also applies to food items — you don’t need to fill your entire spice cabinet before making a single dish. “Try to think about adding at least one larger item, maybe every couple of weeks, that’s a really important flavor,” suggests Brown. Put simply: Decide which flavors you like the most, and buy those first. I often have grand aspirations at the grocery store — buying all sorts of different vegetables I think I’ll use that week. Then, I get home from work, exhausted — and eat a frozen pizza. Apparently I’m not the only one. Brown says food waste is one of the reasons fresh produce can seem more expensive than pre-packaged foods. She suggests only buying produce you “have a purpose for” — at least at first. “Really, so much of the key for budgeting well is to buy your stuff, and then make sure you actually use it all,” she says. A good rule of thumb: Don’t buy some expensive ingredient that only serves one purpose. “One of the tenets of the book is to buy items you can use in multiple ways,” Brown explains. You’ve probably heard this advice before, but may not know how to put it into practice. To help, here’s a fantastic interactive seasonal food guide that tells you what’s in season, based on your state. And if something’s not in season? Don’t be afraid of the canned or frozen aisles. “Frozen produce can be a really great value, and really good quality, too,” says Brown. To combat this, Brown suggests cooking in batches. She even has a “Big Batch” section in her cookbook for recipes to make on your day off and eat throughout the week. Her examples include a big pot of chili or beans that will last several meals, or a dozen hard-boiled eggs you can grab as quick snacks. Brown is under no illusions cooking is as quick as grabbing fast food, but she does believe the extra time is worth it — and once you’ve learned certain cooking methods, it won’t take that much longer. “There is some sort of trade off — I won’t lie,” she says. When you do start cooking, be patient with yourself during the process. “Sometimes, there’s so much guilt around eating healthfully,” explains Brown. Similarly, it’s important to view cooking as an enjoyable activity — rather than a duty. It’s the only way you’ll stick with it! “Focus on the pleasure it can give you, or that it has brought you… rather than the, ‘OK, I’m doing the right thing for my family,’” explains Brown. It’s time to sample the goods! When I asked Brown which recipe I should share, she recommended this crustless quiche — an easy and versatile dish. She also says it’s a great opportunity to use up wilted vegetables or those on the verge of going bad. She promises this recipe will bring them back to life! Melt the butter in a skillet over medium heat. Add onion slices and sprinkle a bit of salt and pepper over them. Cook the onions until they’re golden brown and starting to caramelize. Butter a pie plate and scoop in the onions, creating an even layer on the bottom. The onions add a crust-like texture and a bit of crunch. A note on vegetables: For things like broccoli, cauliflower or winter squash, I suggest steaming or cooking them before adding them to the quiche to ensure they’ll be fully cooked. For tomatoes, zucchini, spinach or any other quick-cooking vegetable, just use them fresh. Spread the vegetables evenly over top of the onions. The dish or pan should look fairly full. In a bowl, use a fork to lightly beat the eggs with the milk, cheese, salt and pepper, just enough to break up the yolks and whites. This is a savory custard mixture. Pour the custard over the vegetables and onions and enjoy watching it fill in all the free spaces. Bake the quiche in the oven for 1 hour. Once the surface is lightly brown all the way across, it’s fully cooked. Let the quiche cool for about 20 minutes, then slice into wedges and serve with a side salad. Sounds amazing, right? Personally, I can’t wait to try all of the recipes in Brown’s book! To grab your free copy, head to LeanneBrown.com. Your Turn: What’s your biggest challenge when it comes to eating healthy on a budget?